"I began following hounds at the age of 5, mostly on my father's shoulders, little legs and the fells not going together! We didn't seem to see much, the foxes in those days seemed to be 'straight necked uns'. In other words, travelling foxes who, once hunted, travelled straight back to where they came from, usually some miles away. There didn't seem to be as many in the later years pre-ban, with many content to run around a valley for example. "These are a random collection of memories. There are no hunting reports, other people, notably Anthony Chapman, have done that so much better (see Bibliography). They are mostly based around the late 1950s to 1974 when lack of work opportunity forced me to move away. 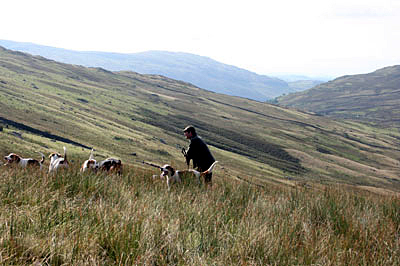 "I continued to follow the hounds in winter and lay on the borrans and breeding earths in summer, but on an occasional basis rather than weekly or more often at times. "These pages lean heavily towards the Coniston and Ullswater but they were our local packs, and not having any transport we usually walked to the meet." "Waiting til the watter warms up"